The all-star show was held to remember the victims of the suicide bombing at an Ariana Grande concert. Despite the circumstances, a celebratory atmosphere prevailed as Grande herself returned to the stage. Visibly moved at times, Grande performed with Miley Cyrus and the Black Eyed Peas, while other highlights were provided by Katy Perry, Coldplay, Robbie Williams, Liam Gallagher and Justin Bieber. Ciara Lynch, 15, from Wigan, was at the original Manchester Arena show, but said she “didn’t think about it really” during Sunday’s concert at Old Trafford cricket ground. 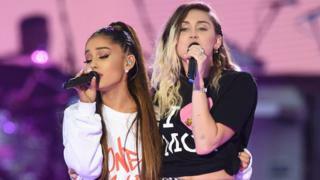 She said the One Love Manchester concert was “amazing”, adding: “It was emotional at the same time. Her friend Lauren Bromelow, also 15, said everybody at the show had “come together as a family”. Sarah Stones, 25, from Salford, Greater Manchester, came “very, very close to cancelling” – but said she was reassured by the heavy police presence. Describing the mood of the night, she said: “This was all happiness. You’re all as one. You’re one team. Her friend Jamal Iddi, 23, from Tameside, said the attack on 22 May “hit everyone in the city”. At the end of the show, Grande was joined on stage by the night’s other stars to perform the song One Last Time before finishing with a poignant solo rendition of Somewhere Over the Rainbow. Earlier, she sang My Everything with students from Parr’s Wood High school in Manchester, comforting 12-year-old soloist Natasha Seth when she was overcome with emotion. Grande wore a One Love Manchester sweatshirt – and many of the fans wore shirts bearing similar messages, or face paint saying “I heart MCR”, or #WeStandTogether stickers.